I always like coming up with different ways to eat chicken breast. Chicken is one of my favorite foods and even though I try to add some variety to my meals and try different cuts of meat I almost always go back to chicken. 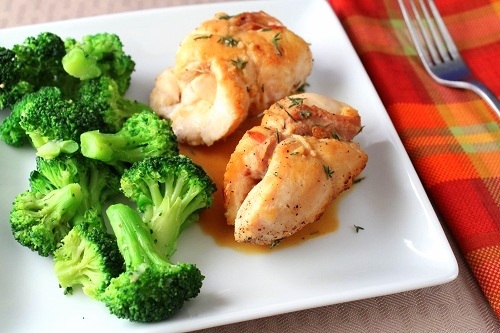 Boneless, skinless chicken breast is so versatile and it is the star of this semi-fancy dish. Place half a slice of prosciutto on top of each chicken breast. Starting from the smaller end roll the chicken to the wider end. Secure the chicken with kitchen twine or toothpicks. Heat 1-2 Tbsp of oil in a large skillet over medium-high heat. Season the chicken with salt, pepper, and garlic powder to taste. Sear the chicken for 2-3 minutes on all sides. Add 1 1/4 cups of the chicken stock (scrapping the browned bits of the bottom of the pan). Reduce heat to medium, cover, and cook for 4-5 minutes or until the chicken is cooked through. Remove the chicken and keep warm. Add the remaining chicken stock (1/2 cup), garlic, and the leaves from the thyme sprigs. Cook for 1-2 minutes or until reduced. Add the Dijon mustard and stir to combine. Serve the sauce over the chicken. *Note carb counts are estimated based on the products I used. Check nutrition labels for accurate carb counts and gluten information.Comments: If you do not have thin cut chicken breasts, regular can be used, but pound the chicken to about 1/4-1/2″ thickness. It was much easier for me to just use thin cut. Also, if you eat dairy it would be great with a piece of Swiss cheese rolled into the chicken. It was almost like a Chicken Cordon Bleu. The Dijon mustard adds a lot of flavor and creaminess to the sauce. It’s just perfect over the chicken. Battle Bacon: What's the Best Way to Cook Bacon?